A would-be escape artist ended up being helped into the back of an ambulance by police after he jumped from a first floor bathroom window to try and evade capture. Arrested on a warrant, Declan Hogg (22) told officers he had to go to the toilet before going on the long journey to the police station and custody. However, police realised something was amiss when they felt a draught coming from the bathroom. When they entered they saw the window was open and Hogg was nowhere to be found. The search for the fugitive did not last long – officers looked out the window of the first floor bathroom and saw Hogg lying on the ground of a back garden writhing in pain. He had to be taken to Forth Valley Royal Hospital with a suspected broken leg. 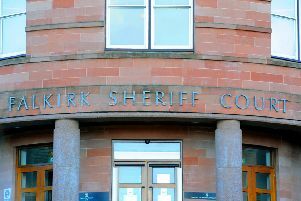 Appearing at Falkirk Sheriff Court on Thursday, having pled guilty to attempting to pervert the course of justice in Bank Street, Slamannan, on November 9 last year. He also admitted behaving in a threatening manner during the ambulance trip to hospital on the same day. Ashley Smith, procurator fiscal depute, said: “Police arrested the accused. He said he needed to go to the toilet and they agreed to the request. He went to the bathroom and police could feel a draught coming from the bottom of the door. “They entered the bathroom and found the window lying wide open – the accused had jumped out of the window. He was seen lying on the ground of the back garden 20 feet below. On the trip to hospital Hogg threatened to kill his mother and told police he would “set fire” to them and then himself. Hogg also admitted assaulting two door stewards outside the Carron Works pub in Bank Street, Falkirk on December 1, 2018. He bit one on the forearm and hit the other on the side of the head with a bottle. Defence solicitor Simon Hutchison told the court Hogg – who is now and apprentice joiner – was “out of control” at that point in his life. Sheriff Derek Livingston place Hogg, 28B Fendoch Road, Grangemouth, on a supervised community payback order for 12 months with the condition he complete 160 hours unpaid work within six months. He was also ordered to pay £200 compensation to each door steward.